HAFLIDI HALLGRÍMSSON (b.1941): Poemi for Violin and String Orchestra, Op. 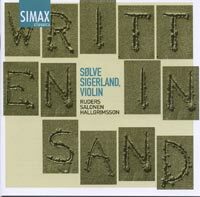 7 (Risør Festival Strings; Per Kristian Skalstad), Offerto (in memoriam Karl Kvaran) for Solo Violin, POUL RUDERS (b.1949): Variations for Solo Violin, ESA-PEKKA SALONEN (b.1958): Lachen verlernt for Solo Violin. Description: Unaccompanied or accompanied, the violin has long been able to carry the full weight of an intricate expressive musical design, as these recent works continue to demonstrate. Ruders' Variations freely adapts a long statement heard at the outset, maintaining a mood of subtle, introverted melancholy. Hallgrimsson's solo Offerto is also elegiac; an in memoriam piece for the Icelandic artist Karl Kvaran (1924-89). Three of the movements are slow, hesitant and melodic; the vigorous third movement is a waspish perpetuum mobile scherzo. His Poemi is a concerto for violin and strings in conventional three-movement form, in which the soloist takes on an eloquent, emotionally charged role, while the inventive string textures provide a constantly shifting background and commentary. Hallgrimsson's music is, as usual, grounded in tonality, with an especial emphasis on sonorous effects in this work. Salonen's 'Laughing Unlearnt' has some features of the chaconne, and an insistent quality in common with his orchestral work Insomnia in a richly-textured (the double stopping is almost constant) work of great dramatic tension. Sølve Sigerland (violin).